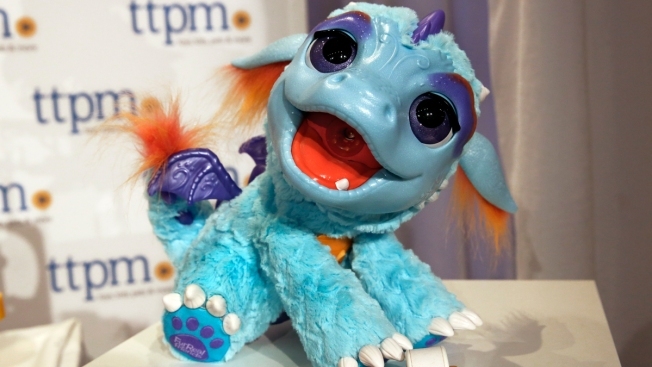 In this Thursday, Oct. 6, 2016, file photo, FurReal Friends Torch, My Blazin' Dragon, from Hasbro, is shown at the ninth annual TTPM Holiday Showcase, in New York. Hasbro reports sales plunged following Toys R Us closing nationwide. With its sales falling due to the liquidation of Toys R Us, Hasbro is looking for new places to sell Monopoly, My Little Pony and its other toys. Hasbro said Monday it will rely more on online sales, although it has also been working on getting its toys into more stores. CEO Brian Goldner said major retailers plan to increase their toy sections to lure former Toys R Us shoppers, which could benefit the toy maker. But, he added, it could take a year before the company sees sales rise again. "We're working aggressively around the world to put the impact of Toys R Us behind us," Goldner said in a conference call Monday. Toys R Us, hammered by shifting consumer trends, is shuttering the 700 stores it has left, depriving Hasbro, Barbie maker Mattel and other toy companies of prime display space nationwide. Mattel, which has been struggling with falling sales for years, had said Thursday that its CEO will step down. The company is set to report its quarterly results later this week. Hasbro said its revenue in the first three months of the year fell 16 percent to $716.3 million from a year ago. That was well below the $824.7 million Wall Street analysts expected, according to Zacks Investment Research. The company, whose other brands include GI Joe and Scrabble, lost $112.5 million, or 90 cents per share in that period. A year earlier, Pawtucket, Rhode Island-based Hasbro earned $68.6 million, or 54 cents per share. There was one less week in the current quarter than a year ago. Adjusted for one-time costs and pretax expenses, earnings were 10 cents per share, less than a third of the 31 cents that Wall Street had expected. For the period ended April 1, Hasbro Inc.'s revenue dropped to $716.3 million, from $849.7 million. Shares of Hasbro Inc. rose nearly 3 percent to $85.05 Monday afternoon. Mattel Inc., which releases its financial results Thursday, rose more than 4 percent to $13.56. Parts of this story were generated by Automated Insights using data from Zacks Investment Research. Access a Zacks stock report on HAS here.